ZSU-57-2 ‘Hellish Threshing-Machine’ Once Again Spotted in Syria 5 out of 5 based on 3 ratings. 3 user reviews. Syrian troops continue to use the ZSU-57-2 self-propelled anti-aircraft gun against terrorists in Syria. The Syrian Army continues to use military hardware, which was kept on warehouses for many years, as commanders believed that it was not suitable for combat usage. One of the models of such military hardware is an anti-aircraft gun, known as ‘Izdeliye 500’ – the ZSU-57-2, entered in service in the Soviet Union in 1950. A photo, showing a Syrian soldier near the anti-aircraft gun, was recently published online. According to various data, the Soviet Union supplied about 200 such anti-aircraft guns to Syria. Units of the Army Air Defense of armored and mechanized brigades were equipped with this military hardware. 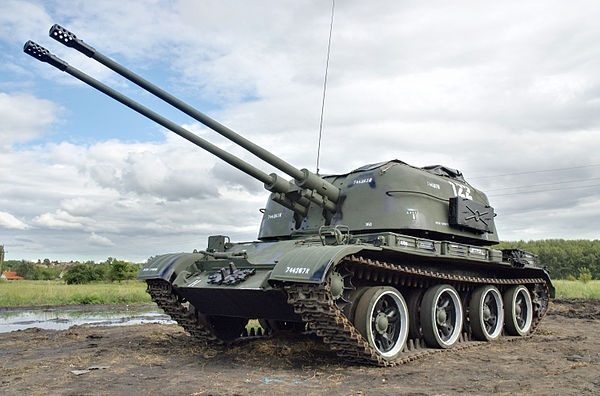 The anti-aircraft self-propelled guns were removed from service in the country in the 1990s. The ZSU-57-2 is armed with the S-68 57mm dual automatic cannon with rapidity of fire up to 120 rounds per minute for each barrel. The operational range on surface facilities is 4 kilometers. Shells of the anti-aircraft gun are capable to destroy light armored vehicles and tanks, such as the T-55 and T-62. A crew of the vehicle consists of 6 people. The self-propelled gun was mounted on the chassis, developed on the basis of elements of the T-54 tank. The engine capacity of 520 horsepower can accelerate the 28-ton vehicle up to 50 kilometers per hour. The endurance distance is 400 kilometers. The ZSU-57-2 was actively used during the Vietnam War, the Arab-Israeli Conflicts. During the Lebanese Civil War, the anti-aircraft gun was used against snipers on the upper floors of skyscrapers in Beirut. During the Iran-Iraq war, the vehicle became a means of destroying enemy troops and armored vehicles. At that time, the ZSU-57-2 was nicknamed a ‘hellish threshing-machine’. According to the Vestnik Mordovii information website, for the first time, the Soviet anti-aircraft guns were spotted on Syrian battlefields two years ago that surprised many military experts. For some time, the military hardware had not been getting caught in the lens of cameras. North Vietnamese used the 57mm Soviet AA weapon to effect. Good weapon to provide fire cover for advancing units within urban confines, those 57mm shells would denude a building in a few seconds exposing the confounded and shocked rats. Watching some WW 2 stock of German army advance on Stalingrad. German Flak 38 used to push into the city. Japanese learned that aircraft dropping to the sea level could drive in under the gun stops of the USN 40mm Bofors AA. Then the av gas and secondary explosions. Over 300 USN ships hit by Kamikaze off Okinawa in 1945. The Flak 38 is a static weapon emplacement, it is good if you try to clear an enemy within 2000 yards, as you say, being immobile made them a target. Today a 20mm Vulcan gun mounted on an APC would provide more firepower and have mobility. 57mm round provides greater effect, even though the rate of fire is more limited. Im not for Assads winning anything at all, but its a very big surprice to me they have been in museum if they have much ammo for them stored as well. Conclusions are as Isherwood & Jesus. They are fine for infatery support in urban areas and SAA has a lot of it and some lack of that kind of heavy stuff even is ammo is back to ammatol. T55 is a reliable “car” as well. Let’s not forget the recently reactivated 160mm Mortar M1943. Oh Yes. I had almost forgotten all the morters. Nice pictures of this one. I have always wished me a Spandauer Michinegewehr M42 for Christmas. I think its because of the 1200 shot pr minut and sound and up to 2300 meters in range. I saw some old russian machineguns taken from ISIS at Raqqa from before 1960. sniff. Im not expert in weapons but I have been a lot about WW2 and afterwards. A good thing for me is, that much which only was in russian now can be translated or are to other languages. Last winter i read all I could find about the socalled Stalin and Molotow defence lines. I didnt know it was Marshall Shukov which had stored so many big canons and had dared being so argumentative with Stalin. NATO connection to East Europe and Balkan crime = weapons sales and transfer to Syria,Iraq. There was a Web article some years back of WW 2 German Rifles, machine guns and ammo being shipped in a large consignment from East Europe. Over the past decades…have copied loads of Bundesarchive photo of WW 2. The ZSU-57-2 is obs. as AA but can deliver a huge amount of fire as direct fire. It’s weakness is a large open top turret. It is still active in some militaries despite it’s age. It is based on the T55 car chassis! https://uploads.disquscdn.com/images/14a276d9124632b45ef6337982d987bd13f8080b9ebfa2711bcc5285effa8f7a.jpg Open turrets can make problems, but at least its in a warm climate – remember the american Hellcat made many ill, because it was very cold. I would say that a fellow like that should have direct walkie talk with the infantery it should support and be kept distant to handgrenades and small RPG`s – and mowe all the time. As long as anyone dont handle it as a tank it will do fine. Giving it more armour will give it less flexibility. Less than 30 km/hour is bad. was wondering if there already wasnt some weapon like this waiting around… too bad they didnt reactivate them earlier, like for Jobar operations. T72s are a bit of an overkill. anyways, put cage armor on them, load with high explosive bullets, and send to nearest frontline…. and please, call ANNA NEWS crew!